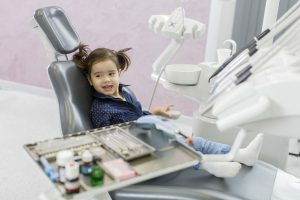 Many parents ask Monrovia pediatric dentist Dr. Q, “At what age should I take my child to the dentist for the first time?” The answer, for some, is surprising. Toddlers should see the dentist at age 1, even if they are still teething. An early visit to the dentist is a great way to ensure that your child’s teeth are growing in properly, that your child isn’t experiencing any tooth decay, and to educate parents on the proper care of their little one’s teeth. What Will Happen at My Child’s First Pediatric Dentist Appointment? Because your child will be so young at his or her first appointment with Monrovia Pediatric Dentist Dr. Q, this 1-year-old appointment will be more like an informal meeting. Dr. Q will confirm that your child’s teeth are growing in properly, and may even perform a cleaning. X-rays are rarely required at this age, though they may be ordered if your child has signs of tooth decay. Once your child has seen Monrovia pediatric dentist Dr. Q for the first time at age 1, he or she should return to see her every 6 months. Over time, these bi-annual check-ups will become longer appointments as your child has X-rays taken and teeth cleanings. What Are Proper Oral Hygiene Tips for Children’s Teeth? Even before you child starts teething, you should clean his or her gums with gauze or a warm, wet washcloth to remove any food, breast milk or formula debris. Food left over in the mouth can cause bacteria, which can even lead to gum disease in small children. Baby teeth should be brushed twice a day. Baby toothbrush options include a thimble-like device that goes over your index finger and soft bristled toothbrushes. Fluoride is an important part of a child’s oral hygiene, but swallowing fluoride toothpaste can lead to discolored teeth or a tummy ache. Until your child is old enough to spit out his or her toothpaste, use training toothpaste – which doesn’t have fluoride. Once your child is old enough, switch to fluoride toothpaste. Even though you child may not be getting fluoride from his or her toothpaste, he or she may be receiving a low dose of it from tap water. Ask Dr. Q about fluoride supplements if your child uses training toothpaste and doesn’t drink tap water. Many parents also have questions about when and how often they should floss their child’s teeth. The answer is that children’s teeth should be flossed every day as soon as there are two teeth next to each other. Some parents prefer using traditional floss, while others prefer using pre-threaded flossers. Find out which option is best for you and your child, and stick with it. Not only is it necessary to remove plaque from your child’s teeth, but also oral hygiene habits are developed young, and your goal with brushing and flossing your child’s teeth early is to teach your little one about proper dental hygiene so he or she will have the habit ingrained in them as an adult. If your child is approaching 1, or if you haven’t yet taken your child to a Monrovia pediatric dentist, there’s no better time to start than today! Call Monrovia pediatric dentist Dr. Q today at (626) 599-9818.